(MENAFN - Muscat Daily) Muscat- Avenir 2018, career guidance programme for students from all the 20 Indian schools across the sultanate, was inaugurated on Friday by Dr Hassan Kashoob, vice chancellor of Dhofar University at Indian School Ma'abela. The two-day event, organised under the auspices of the Board of Directors, Indian schools in Oman, provided umpteen opportunities to students to get themselves acquainted with courses and careers in diverse domains. Avenir is a French word meaning 'future'; and most significantly, the programme was aimed at showing the future pathway, helping students take judicious decisions in choosing their future course and career. The event had an array of 16 career talks delivered by eminent professionals from different domains. The career talks focused on 21st century skills set, career opportunities, challenges and insights for future generation. Dr Baby Sam Saamuel, chairman, Board of Directors, Indian schools in Oman, welcomed the august gathering and underscored the significance of Avenir 2018. Yusuf Nalwala, former chairman of the Board of Directors, was the special guest on the occasion. Members on the Indian School Board, Management Committee of Indian School Ma'abela, principals and teachers of different Indian schools were present on the occasion. The first day's programme included a key note address by Dr Kiran G R, dean of Middle East College, and culminated with a panel discussion on 'Imperatives of Digitalisation'. H E Munu Mahawar, Ambassador of India to the sultanate, was the chief guest. 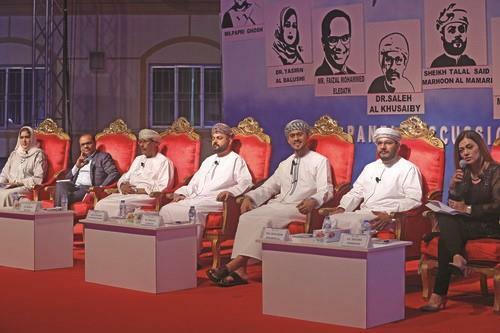 The panelists consisted of industry experts from diverse domains and included names such as Sheikh Talal Said Marhoon al Mamari (CEO, Omantel), Tariq Hilal al Barwani (founder, Knowledge Oman), Dr Saleh Mohamed al Khusaiby (dean, College of Medicine and Health Science), Dr Yasmin al Balushi (dean, Muscat College), Eng Mohiuddin Mohamad Ali (vice chairman, Galfar), Faizal Mohammed Eledath (chief transformation officer, NBO) and Mohana Prabhakar (CEO & MD, Apex Press & Publishing). The panel discussion was moderated by Papri Ghosh, principal of Indian School Ghubra. The renowned author and motivational speaker Shiv Khera delivered the key note address on Saturday at 6.30pm. Dr C M Najeeb, vice chairman, Board of Directors, Indian schools in Oman, proposed the vote of thanks. Avenir 2018 was yet another effort of the Board of Directors of Indian schools towards ensuring that every child undergoes transformative learning and be equipped with knowledge, skills and well-being.